In The Challenge, I alluded to the lack of a reliable historical record and problems with the early Yashima/Yashica model history as it has been generally presented. The various “-pedia” sites, previously somewhat lacking in model detail but otherwise able to provide references for some of the company's milestones, are not immune from ill-informed comment creep by otherwise well intentioned and enthusiastic Yashica owners. Some of the sites' early 1950s model commentary seems to rely on period Japanese advertisements, many from Asahi Camera magazine. These are an excellent and original resource but still require researchers years later to interpret momentary snapshots in time. For example, the Yashica model list of Japanese Wikipedia claims that the shutter on the original Yashica Flex B was changed to a Copal with 1/10 to 1/200 speeds (presumably, from an NKS-FB with a full range of speeds to 1/300). That is repeated on several Japanese sites but is most likely to have been a mis-identification of a model A-I example which is quite rare in Japan. In quite a few respects, not only my research and conclusions but the visual evidence itself, contradicts the doyens of the collecting world, McKeown internationally and Sugiyama in respect to Japanese cameras and on whom, some say, McKeown may have relied (I will specifically address Sugiyama in another section). Well, maybe not Sugiyama so much, it's what he has left out and how he has been interpreted by others. However, they are cataloguers and generalists focused on the collector’s market rather than the intricacies of individual maker history and models. One word of warning. There are several sites with examples of cameras with lenses and/or focusing hood logos that don't match the model. An incorrect logo usually, but not necessarily, means that the whole hood has been replaced after a fall (even Sugiyama shows a 1954 Yashicaflex S with a focusing hood style that arrived in 1957 and the logo dates it to the end of 1959 or later). Sometimes, the later glued on logos simply fell off and may have been replaced by what was available (but from my experience, that is far less likely than the whole hood being replaced). Many parts are largely interchangeable. One example does not necessarily mean that it left the factory that way (at least two examples make it more likely). Also, I have seen sellers ask big money for kits with boxes when the camera is from the 1960s and the box is from the 1950s - take everything with a grain of salt and do the research. Two related mistakes often made are assuming budget models are older than more sophisticated models and this comes from thinking that models were released in a linear fashion, i.e. one after the other, when even at the end of 1954, there were already a number of Yashicaflex models in production simultaneously. The Yashica A, B, C and D are not developments of each and were not released in that order. The A and C came first in 1956 (named after the Yashicaflex models they evolved from) and the B and D came some 2 years later. 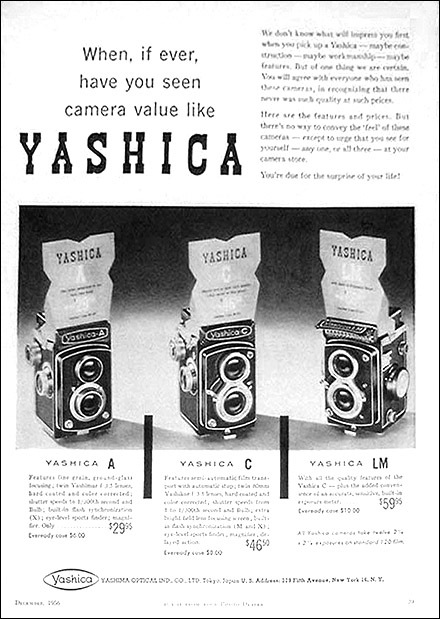 Yashima/Yashica initially used the letters “A”, “B” and “C” for Yashicaflex models to denote where the camera sat in the model range based on feature set, the A series being the most basic and released after the first B model. The letters “A” and “B” were also reused for unrelated later model Yashicaflexes. The Yashica D was probably the only true “alphabet” release as the next available letter (the subsequent “E” may also have been but Yashica used the term “electronic eye” to describe the selenium cell based automation and there was a similar 35 mm “EE” model, either way, it could simply have been a convenient coincidence). The first 1964 edition of the popular Focal Press Yashica Twin Lens Reflex Guide by W.D. Emanuel helped to set the incorrect thinking in stone by claiming that the Yashica D developed from the A and included a flow chart demonstrating this and that has appeared in many other places. The impact of the Yashicaflex models was completely ignored (the Yashica D was in fact a rebadged, Japanese market, late model Yashicaflex B). He may not even have been aware of them but in any case, his user guide was for then current models, not a history book. A third mistake may be related to Yashica/Kyocera itself, or at least that is where the credit/blame appears to belong. Often, precise introduction and discontinued dates are quoted to the month which gives an impressive air of authority. The introduction dates particularly are widespread throughout the net. One source is the useful book, “Collector's Pictoral Encyclopaedia & Value Guide to 6x6 TLR Cameras” by Karl F. Kahlau which lists model release and end dates and production numbers “partly supplied by Yashica/Kyocera”. Another is an archived page, “A Partial History of Yashica TLRs” , from a defunct Yashica site authored by Alan R. Corey, listing similar release and discontinued dates “from a table supplied by Yashica/Kyocera”. The focusing hood black on black logos and two silver squares date all three examples of these earliest trim versions to no later than early 1957. Neither the Yashica-Mat nor any model released, or available, after then has that trim. The construction of the hoods themselves changed (see Focusing Hood Assemblies) with the change to the revised logos and single silver square. A Partial History of Yashica TLRs quotes release dates of October 1956 and March 1957 for the Yashica LM and C respectively and April 1958 for the Yashica A (1958 is quoted almost everywhere, my early edition of McKeown's has 1959, presumably based on Sugiyama's Japan only A III variant) whilst the book uses dates of October 1957 and March 1958 for the Yashica LM and C (exactly 12 months difference - unconnected coincidence?) and no date for the Yashica A. However, the ad below, featuring all three cameras together, is dated November 1956 with the reverse side identifying the publication as Modern Photography. The same ad appeared in U.S. Camera, claimed also to be in the November 1956 edition (no date is evident on the single page displayed for sale). 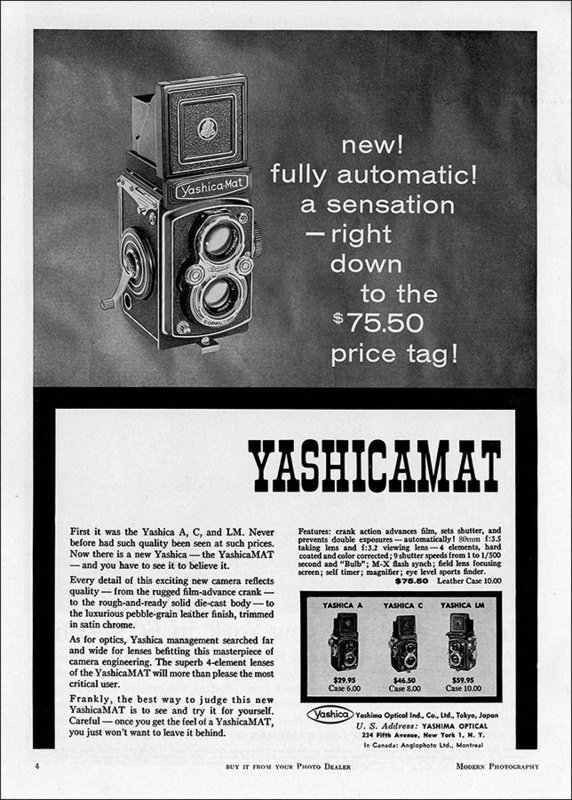 After these ads, the three cameras appear together with the new Yashica-Mat in numerous 1957 ads (see US and Swedish ads on this site). I thought that given magazine lead times etc, an October release was very plausible. Pre-production models must have been floating around since the middle of the year. Clearly, Yashima was making a concerted effort and with models ready, I couldn't imagine a release too close to Christmas. Recently, contributer Tom Heckhaus very kindly gave me some publications (which I was aware of but had ignored as simply user guides) one of which is the “Yashica Guide” by Richard Lowell (quite common, appears on eBay from time to time). 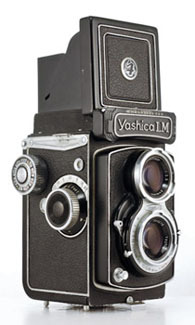 In his March 1958 Introduction, he states, “The name Yashica is relatively new to the American market. Introduced in September 1956, it was quick to become one of the most accepted names in photography...”. Dr. Kenneth S. Tydings says in his 1958 edition of the “The Yashica Guide” that “Yashica Reflex Cameras were introduced to the American public in 1955 and by 1956 were firmly entrenched as the most important name in twin lens reflex cameras on the basis of quantity of cameras sold.” I strongly suspect that Richard Lowell was referring specifically to the “Yashica” named models whilst Dr Tydings was also including the earlier “Yashicaflex” cameras. I don't question Richard Lowell's September 1956 date but it is quite possible that he was referring to the camera dealers' preview. The difference between September and November can be just over one month or as long as almost three months, depending on the actual dates. 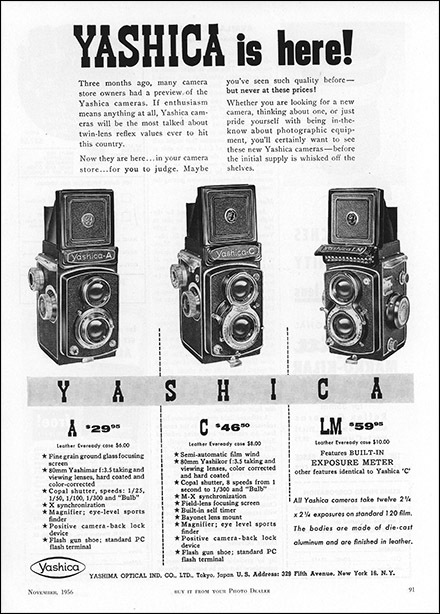 As I have seen no evidence of earlier ads, I have taken the conservative view and I have now adopted November 1956 as the most likely release month for the Yashica A, C and LM, although September and October remain possibilities as well. Although no further proof is required for a 1956 release, there is also the forensic evidence. 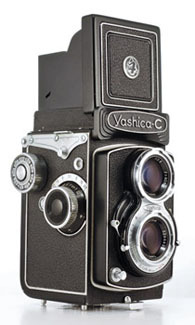 The focusing hood (as noted further above), spool knob and locking lever trim details on the earliest examples of the three cameras are consistent with the 1956 period and match the Yashica Rookie released earlier in 1956. The Yashica LM and C were released with film counter reset buttons (which they lost well into their production runs). Cameras accepted as released in 1957, the Yashica-Mat, Yashicaflex AS (new model) and Yashicaflex B (new model), had newer trim styles already and were also fitted with fully automatic film counter reset from the outset. Except for colour, all three cameras have identical user manual covers for their first two editions, also unusual for the 1950s period. It may be be a matter of interpretation or translation but I suspect that the data attributed to Yashica/Kyocera has been assembled many years after production of the respective models and with what purpose, source records or due diligence, we don't know. 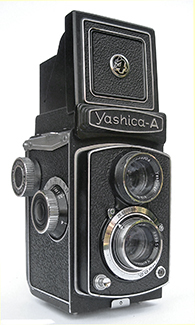 Elsewhere on this site, you will find that there were Japanese market cameras with “Yashicaflex” on the nameplate but which were marketed as “Yashica” models and which borrowed names from quite different export models - this may be a factor too. Whatever the reason, please take any such apparently authoritative information with a grain of salt and keep an open mind and weigh up the evidence when presented with conflicting information from this site. You will note that with the author's kind permission, I do reproduce much of the Yashica/Kyocera sourced information from Karl Kahlau's book later on. This one has me totally flabbergasted. So many sites claim a 1958 release date but it is a so not 1958 camera. All it takes is for one person to get it wrong in the beginning and it gets repeated. Even the useful camera-wiki.org gets it totally wrong as does Japanese Wikipedia. It is possible that it may have been announced in late 1959 but it was released at the beginning of 1960. Forensically, the black radial control wheels did not appear on any model until mid-1959. The narrow “Y” on blue background hood logo of all examples found in the wild first appeared on 44A and 44LM cameras in mid-1959 and on 66 models in October or November 1959. All found in the wild Yashica-Mat LM examples have a dual scale focusing knob. These were uniformly adopted across all models in late January/ early February 1960. A US ad dates the first US showing to the end of March 1960 (see Yashica Mat-LM). By serial number, the pre-production examples in the user manual and early brochures date to November 1959 and feature the early Yashica-Mat hood logo and other small differences, the in the wild examples start with February 1960 serial numbers. There can be no argument, it is absolutely 100% an early 1960 release. Here I am simply floating the contradictions between observation and often quoted dates which can probably be traced back to a single source. The Pigeonflex is claimed to be released in March 1953 and the mildly revised Yashima Flex in October 1953. I have seen no evidence which would question (or confirm) those dates. 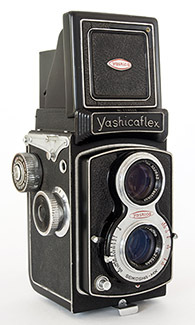 With a new nameplate, the almost identical Yashica Flex B (old model) is claimed to be released in December 1953 and the iconic Yashica Flex S with exposure meter is claimed to be released 10 months later in October 1954. 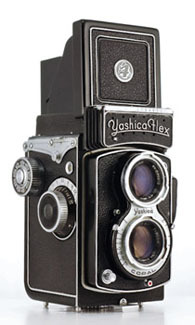 The Yashima Flex was certainly in production longer than a few months - it progressed through SYK shutter, three versions of the NKS shutter, two distinct nameplate styles and several iterations of focusing hood as well as being advertised in a Japanese magazine in February 1954 and in a Swedish magazine in December 1954. 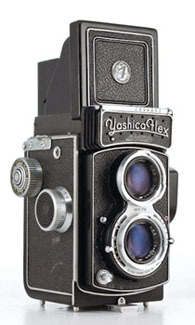 In the same context, there is mounting evidence, albeit circumstantial, that the Yashica Flex B and more advanced Yashica Flex S were released near simultaneously with different specs aimed at different price points and that the release date was earlier than the commonly quoted October 1954 but significantly later than December 1953. 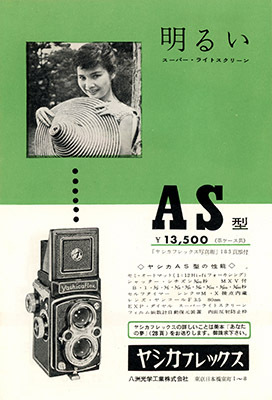 In fact, it is now confirmed that an early Yashica Flex S, but certainly not the earliest type, appeared on the cover of the August 1954 edition of a Japanese photographic magazine. The issues are dealt with under the individual model entries in 66 Models but the main indicators are shared bodies between the Models B and S with film start marks (of no use in the Yashica Flex B), shared shutter initially (NKS-FB), same lens name on early examples of both (“Tomioka Tri-Lausar” whereas late example of the Yashica Flex B changed to simply “Tri-Lausar”, perhaps when the Model S changed to “Heliotar” lenses), early examples of both had the same pattern of first four ring tripod mounts on the base and then three ring and the flash sync changed from the ASA type to PC type at a similar time in production. Both shared almost identical boxes except for “Model S” on one. 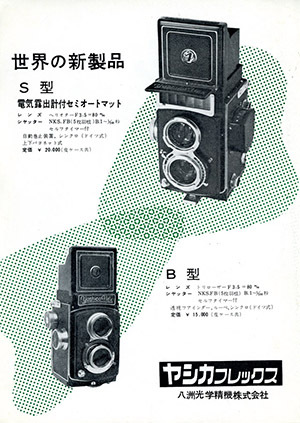 Both the Yashicaflex Model B and S were still being advertised together in Sweden in March 1955 and also in what appears to be quite an early Japanese flyer below (a slightly later version plus a different brochure featuring both models are accessible from the Brochures page). Also, if the Yashica Flex B was the first and only model Yashica Flex when it was released, why did it need to be called “B”? 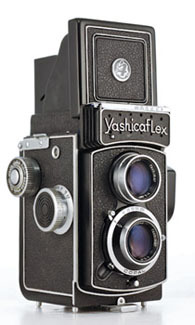 The first of the Yashicaflex A series models was probably launched in October 1954, as claimed. These were a new, separate budget line sold alongside the Yashica Flex model S and later, Yashicaflex model C, with a more basic shutter than their predecessors and with new budget lenses, Yashimars, only found on A series cameras including the early Yashica A and its near twin, the Yashica Rookie. 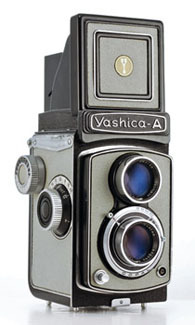 The trim features clearly date the Yashicaflex A series as a later release than the Yashica Flex B and later than the first of the Yashica Flex S variations. Most reputable sources are in agreement, yet some of the same sources claim that the rebadged Swedish market MolfoReflex was released in 1953, not realising that behind the nameplate it is simply a Yashicaflex A-I and by its slightly later trim, probably from early 1955. 1954 Yashicaflex AS-II, 1957 Yashicaflex AS-II and unrelated 1957 meterless Yashicaflex AS (Japanese domestic market model) released after the Yashica-Mat . The AS-II shares the basic body and Sekonic CB-1 exposure meter of the Yashicaflex S but not the lenses or shutter. In “Yashicaflex A Series”, it can be seen how the model designation makes logical sense; “A” for A series, “S” for Sekonic meter and “II” for film counter with auto-stop winding. 1954 Yashicaflex S and 1956 Yashicaflex S for comparison. 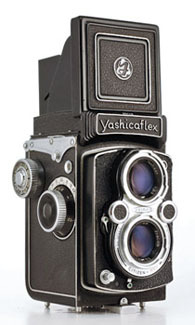 Note the Bay 1 filter mounts and different nameplate script in the style of the earlier Yashima Flex and Yashica Flex B (old model). 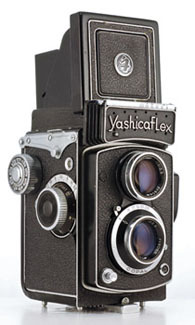 Note also that both the Yashicaflex S and AS-II have the same early and late body types and trim proving conclusively that they are largely concurrent models. What could the “AS” possibly signify for this camera? An example of early “retro”? Quite possibly, this is one of three Japanese market Yashicaflex models with recycled model names released within a few months of each other (the others are the Yashicaflex A and B with “new model” added by collectors. Note, in trying to make sense of the AS-I, AS-II and AS models, some researchers and commentators, including Karl Kahlau, have assumed that there was only one earlier model and that must have been the AS-I, therefore the 1957 camera must be the AS-II. This fits with neither the above brochures nor the names on the 1957 user manuals and boxes. 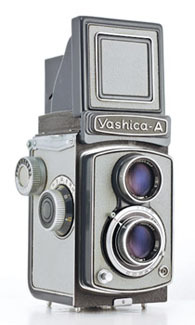 The first camera is a late 1950s Yashica A (released in black form in 1956). The second camera is a 1959 Yashica A III. Whereas the Yashica A is found with both feet and metre (small numbers for Europe) focusing scales, the Yashica A III is found only with metre focusing scales. The only other difference between the A and A III is that the focusing hood logo is absent on the A III. The reason that Yashica was forced to choose a different name for its delayed release domestic version was that it had previously released the third camera above, the Yashicaflex A (usually referred to as “new model” by collectors), in August 1957 but like several other cameras with “Yashicaflex” on the nameplate from this period, it had been widely advertised in Japan as the “Yashica A” (exported later as the Yashica B). All three cameras use the same yellow Yashica A box. This is also discussed elsewhere (with evidence) including the relevant 66 Models pages. The camera is not mentioned anywhere else that I have found and most people are totally unaware of its existence. Possibly because of the confusion of Yashicaflex cameras being advertised as “Yashica”, several Japanese sources refer to the 1959 Yashica A III as the “Yashicaflex A-III”, or similar, even though, as far as I can tell, the Yashica A III was never advertised as a Yashicaflex. In his “Production List of Yashica 6x6 TLRs”, Karl Kahlau (see earlier above) also refers to a “Yashica Flex A III” of 1959 when presumably he means “Yashica A III”, or possibly not. A photo of the Yashica A III is labelled “Yashica-A April 1958-April 1959” (incorrect release date in either case). Just to demonstrate how difficult it is to glean facts correctly, most/all Japanese brochures (including those on the Brochures page) show the Yashica A III with hood logo (probably just a photo of a Yashica A, or omitting the logo was a late change before production started). You may well ask “how can you be sure that camera two is a Yashica A III?” My answer is “Sugiyama agrees” but also, there are more substantial indicators in the Yashica A III entry. These are rarely encountered cameras. The operation of the Yashicaflex model AS-I (also called “model-AS” and “model AS”) is mentioned in two user manuals, perhaps a year or so apart, and it is listed as an available model in a third manual. In each case, reference is also made to its close cousin the Yashicaflex AS-II (confusingly, sometimes this also is referred to as the “model AS” but clearly different to the AS-I) of which there are plentiful examples, yet there have been no confirmed sightings of the AS-I. There are seven examples in my database of an unknown Yashicaflex mystery model with an advanced Copal MXV shutter, Bay 1 filter mounts, basic Yashimar lenses and film advance by red window. An unusual mix but in reality, identical to the Yashicaflex A2, except for the Bay 1 mounts, which is also sometimes found with the Copal MXV instead of Citizen shutter. Is it simply a “super A2” or a different model? A real conundrum. The Yashica Hi-Mec is not mentioned anywhere but there are two examples in my database. There is a photograph of a Yashica Auto 44 in Sugiyama's book and Collectiblend records a single sale in 2003 but there are no other confirmed sightings. It has been suggested that the Auto 44 was a name used in some markets instead of 44LM but reference to Sugiyama's photo reveals quite different specs, trim and even features. My own thoughts are that the Hi-Mec and Auto 44 may have belonged to limited pre-production runs of what turned into the Yashica LM and Yashica 44LM respectively. These are the only two of all the named models identified on this site without any mention in ads, brochures or user manuals. Details of the mystery models are on the respective 66 Models and 44 Models pages. If anyone has photos or information which will cast some light on these cameras, please contact me (see contact details).